Enter the worlds of Keith Laumer. From the adventures of self-aware superheavy battle tanks to the intricacies of galactic diplomacy via the clash of parallel worlds, Laumer's imagination knew few bounds. In Worlds of the Imperium, an American diplomat finds himself kidnapped by agents of the British Empire, which rules over a parallel world. James Retief travels the stars, resolving conflicts and avoiding cultural clashes, while battling the endless bureaucracy of the Corps Diplomatique Terrestrienne in Retief: Envoy to New Worlds. 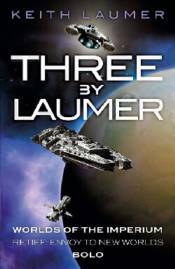 In BOLO, Laumer explores what happens when mankind's most advanced weapons of war become self aware.